Considering the population increase in the cities and also the increase of per capita water consumption in these societies, the use of treated effluents for the green area irrigation has been taken into consideration. Human ever-increasing needs to green area in municipal societies and on the other hand the limitations in water supplies cause a new review in wastewater reuse. Also making use of treated effluents in irrigation has some limitations including clogging of the soil porosities, increasing of the chemicals and toxic substances to plants and increasing the probability of groundwater pollution. In this research, considering the indicators using recognition of the effluent’s quality, at the first stage compound samples of domestic wastewater treatment effluents of Zamyad Factory were taken. The samples were tested from the viewpoint of quality. Results showed that the indicator of Sodium Adsorption Ratio, Sodium Percentage, amounts of chloride, and electrical conductivity comparing to Food and Agriculture Organization and Department of the Environment of Iran standards were higher than the standard levels. Also parameters such as TDS, TSS, BOD, COD, anions and cations were in standard levels. Results also showed that the increase of some of the undesirable parameters was not related to the operation of wastewater treatment plant. Therefore, in order to make the standard effluent, different methods may be proposed and the most practical and economical one is dilution by using 50% mixing with raw water. Water shortage is one of the main obstacles in development of green areas in many countries especially in those which have less amount of water. Considering growth and expansion of communities and cities along with industrial development, green areas development is also necessary. In developed countries together with industrial development, applied studies on reusing treated wastewater have been done. In 1889 for the first time, treated wastewater was used for the irrigation of the green areas in San Francisco (Mathan, 1997). Then with more essential conception of using treated wastewater in agriculture, green areas and gardening, big success was achieved in Panama city in California state in 1929 (Xie, and Kuffner, 1993). In recent decades with impressive progresses made in wastewater treatment, water produced in this way is more wanted. On the average, 60% of wastewaters in United States are reused (Harury, 1997). 432 million cubic meters wastewater is treated in the state of California, 260 million cubic meters of which is used in agricultural activities (Pescod, 1992). The same activities were begun in Japan in 1968, and in 1996 more than 13 million cubic meters treated wastewater were reused in agricultural activities (Taniyama, S. and Adachi, 1999). In the Middle East, considering water crisis, investigations on reusing the wastewater have begun. Pioneer countries are Morocco, Jordan, Pakistan, Oman and Saudi Arabia (Arabi, et al., 1996). In Mediterranean countries due to population increase and periodic drought, municipal and agriculture authorities are considering the reuse of treated wastewaters. In Portugal, comprehensive investigations have been done to determine required standards for irrigation by using treated wastewaters. Results show that a proper method of treatment of domestic wastewater is stabilization ponds and the treated wastewater can be used in agricultural irrigation (Krauss, 1997). From the view point of quantity, it gives a reliable source of water for agriculture. It leads to reserve safe water sources and using it for important and economical consumptions. It reduces the risks of disposing the untreated wastewater into our environment. Nutrients such as nitrogen and phosphorous which exist in wastewater have good impact on plants if they are at standard levels. Suspended solids in treated wastewater clog the porosity in the soil in the course of time and prevent breathing of roots. Some dissolved compounds in wastewater are toxic for plants. Some dissolved compounds can be accumulated in plants and if these plants are used directly or indirectly they will be measured in human's food chain (Asano, and Levine, 1996; Boll, and Dernbach, 1986). The purpose of this investigation was to study the quality of domestic wastewater plants and to assess possibility of using this wastewater in watering green areas around the Zamyad factory. Zamyad automobile factory is located in south-east of Tehran. This factory has been manufacturing different kinds of vans and trucks since 1971. Zamyad factory has one domestic and one industrial wastewater treatment plant. To determine the amount of elements and chemical compounds in the wastewater of the factory, combined sampling was done. In this method a 20liters tank was used at the entrance of the plant to get 5liters samples of the wastewater every four hours. Finally after two work shifts (16 hours) in all, 20 liters of sample were collected. After mixing them, the sample was sent to the lab to measure different chemical and physical parameters. Special sterilized containers were used to get microbial samples. 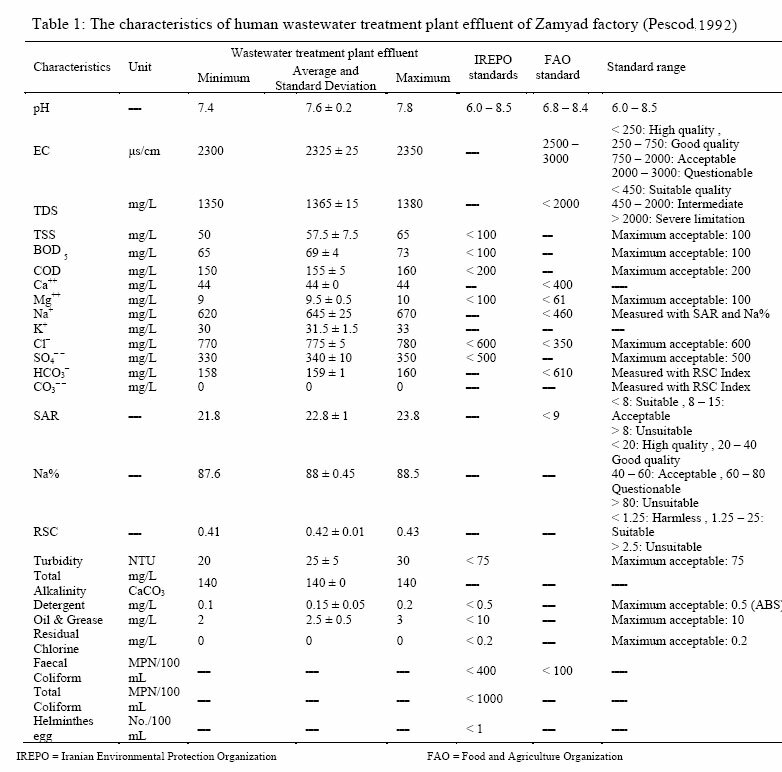 These samples were taken gradually according to standard methods (WHO, 1993). Where the units of the cations are in (meq/L). Results were compared with Food and Agriculture Organization (FAO) and Department of the Environment of Iran Standards(DOE) standards. According to the results, a decision can be made whether to use treated water for irrigation or not. The test results are shown in Table 1. Adding calcium and magnesium to wastewater effluent can lead to decrease of SAR and Na% and increase of TDS and EC. According to researches done by Haruvy in 1997 in connection with using membrane methods such as reverse osmosis, we can eliminate the amount of dissolved solids in wastewater effluent in accordance with the standard levels. But setting up this system is expensive. According to studies done by Escontria, the best choice is to dilute the treated wastewater up to 50% by an available source of water, which will not be any problem to irrigate the green areas for a prolonged period. Some other qualitative parameters such as turbidity, TSS, BOD, COD, detergents, oil and grease are now at standard levels. According to similar researches done by Jame in 1985, in case any of these parameters reach above the standard levels a pressure sand filter can be used. Special thanks to Zamyad Factory employees, Mr. Bahman Aghakhani, manager of planning and development department, Mr. Alireza Faraby, manager of Human Resources and Financial Department, Mr. Assalforoush, deputy of Planning and Development Department and Mr. Mazloumi, person in charge of company's Health Department, who helped us in this research. Alizadeh, A., Haghnia, G. h. Naghibi.,(1996). Using treated domestic wastewater in irrigation, Second national congress of water and soil problems in Iran., 332 340.
on irrigation and drainage, (ED). C. A., Madramootoo and G. T. Dodds, Cairo, Egypt, ICID., 102 114. Asano, T., Levine, A. D.,(1996). Wastewater reclamation: recycle and reuse - past, present and future. J. Water. Sci. Technol., 33: 114. Boll, R., Dernbach, H., (1986). Aspects of land disposal of wastewater as experienced in Germany. J. Water. Sci. Technol., 18: 383 390. Daie, M., (1995). Health aspects of wastewater reuse. J. Water.Environ., 2: 3037. Escontria, M. C.,(1999). A strategy for water reuse in farm irrigation, Int. seventh congress on irrigation and drainage, International Commission on Irrigation and Drainage, Granada, Spain, ICID, (IG)., 121135. Harury, N.,(1997). Agricultural reuse of wastewater: Nation wide cost benefit analysis, J. Agr. Eco. Environ., 66 (2): 113119. James, Y. W., (1985). Use of wastewater for irrigation, Int. Canada Agriculture, Communication Branch. J. Agr. Canada., (31): 28 31. Krauss, G. D.,(1997). Wastewater sludge and food crop. J. Biocycle., 38 (2):74 82. Massoudinejad, M. R., (1994). 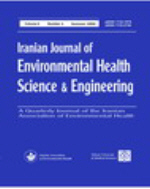 Evaluation of Maharlou lake to salt pollution and heavy metals because of municipal wastewater discharged to the Khosk river, research plan, Research Department of Shiraz Medical Sciences University., 255 270. Mathan, K.,(1997). Studies on influence of long term municipal sewage effluent irrigation on soil physical properties. J. Bioresour. Technol., 48 (3): 273 278. Pescod, M. D.,(1992). Wastewater treatment and use in agriculture, Food and Agricultural Organization (FAO), Irrigation and drainage paper, number 47, Rome, Italy: FAO ., 978 989. Rand, M. C., Greenberg, A. E., Taras, M. J., (1981). Standard Methods for the examination of water and wastewater, 14th Ed. American Public Health Association, Washington D. C., 513 565. Research department of environmental protection organization of Iran, (1994). effluentdischarge standards, Burro of environmental education publications., 15 39. Taniyama, S., Adachi, O., (1999). Utilization of treated sewage water for irrigation in paddy field areas in Japan, Int. seventeenth congress on irrigation and drainage, International Commission on Irrigation and Drainage, Granada, Spain, ICID, (IG)., 45 53.
WHO (1993), Guidelines for drinking-water quality, volume 1: Recommendations, 2nd Ed, Geneva, Switzerland, 537 546. Xie, M., Kuffner, U., Moigne, L., (1993). Using water efficiency, World Bank technical paper, number 205, The World Bank, Washington D. C., 455 460.